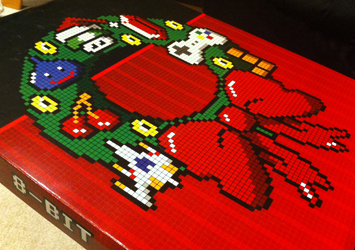 When people say “8-Bit”, the most common thing they’re talking about nowadays is the “8-bit era” of video games – when the first Nintendo Entertainment Systems burst onto the home video game scene along with Super Mario Bros., which ended up holding the record for the best-selling video game in history until 2009. 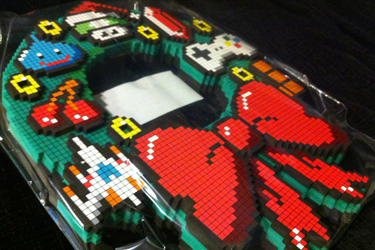 Well recently, there have been a slew of “8-Bit Products” that recreate the graphics of an 8-bit game system, but in tangible form – for example, you can get 8-bit sunglasses, or treat someone to flowers that really last with an 8-bit flower vase. But “8-bit” is kind of its own art form in a way nowadays; there are items created with characters that never even appeared in 8-bit form like the Ghostbusters or the crew from Star Trek, and characters have been brought into 8-bit even though they’re from today, like the cast of “Community.” I always thought these were pretty funny, but never really saw anything that I could justify getting … until last year, when ThinkGeek.com got me with their “8-bit Holiday Wreath” – this thing is hilarious, awesome, and festive all at the same time. Unfortunately, I didn’t jump at the sale price last year, and they sold out before I got my hands on one of my own. This year, when they came back (and I found them on sale again! ), I grab myself an early Christmas present. If you think back to holidays gone by, the one thing you’re bound to recall is the year you got your first game console. Sure, there are other memories, but seriously, who has the non-volatile RAM to retain all that data? 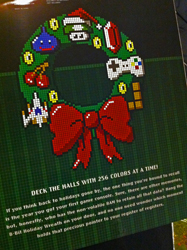 Hang the 8-Bit Holiday Wreath on your door, and no one need wonder which moment holds that precious pointer to your register of registers. And … the unboxing. Sweet! 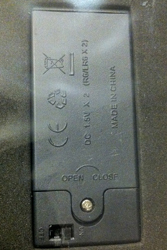 There’s a battery compartment on the back because, get this, the gold Mario Bros. coins twinkle! 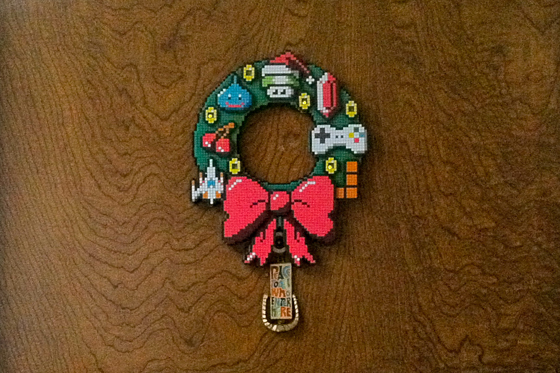 This wreath has some awesome details: a Galaga space ship, cherries, a Slime from Dragon Quest, a Santa-hatted mushroom, a gem from Zelda, a controller (albeit one belonging to the SNES, which was the famously “16-bit” console that came after the NES – weird consistency gaff IMO), and a Tetris piece. 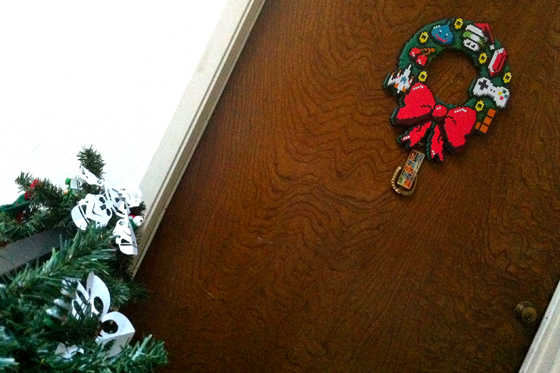 I eagerly placed this on the door – unfortunately, our LOST decoration (featured in my other wreath post and actually also seen when I treated that squeaky door) had to finally come down after almost three years … but it was time. 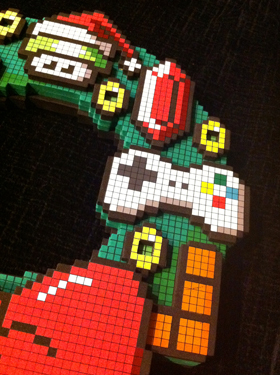 Along with my Star Wars snowflakes, my decorations are geektastic! 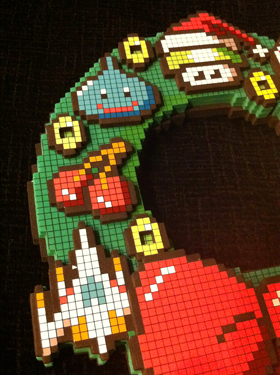 And here’s the new wreath in action!